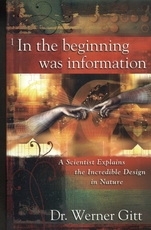 In his fascinating new book, In the Beginning was Information, Dr. Werner Gitt helps the reader see how the very presence of information reveals a Designer . . . It all points to a Being who not only organizes biological date, but also cares for the creation.